The Israeli army has stepped up military measures on the border with the Gaza Strip after demonstrators gathered there for the Great March of Return, today. According to a military reporter for the Israeli news site Wallah, the Israeli army is preparing for another protest planned for the weekend, and has issued directives to its soldiers to open fire on any armed Palestinian up to 300 meters from the border fence. The military reporter also said that the directives included an order to open fire at any Palestinian protester if he comes within 100 meters of the border fence. The Israeli army is building a sand barricade and installing more barbed wire fences and is planning to detain any Palestinian who crosses the border, PNN further reports. Sources also said that the Israeli army has been observing Hamas bases along the borders, claiming that Hamas is carrying out additional activities beside the protester camps, to hinder the work of the Israeli soldiers. 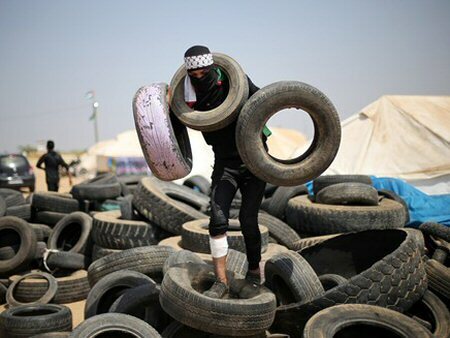 Palestinian protesters in Gaza have been collecting thousands of tires and placing them along the borders in order to burn them during the Friday demonstration, in order to obscure the vision of Israeli soldiers.